Hair dryers are essential accessories that every single one of us needs. They help us to get ready faster and to obtain that perfect look that we are used to, even when traveling. The first thing that comes to mind when thinking about portable hair dryers is probably that in 2018, even the cheapest hotel is equipped with such accessories. Even so, there are many reasons why you should own portable accessories. When it comes to your hairstyle, there is nothing more important than using the tools and products that you are already used to. Most hotel hair dryers probably don’t meet everyone’s requirements in terms of intensity, temperature, air flow, power, shape and many more, which is it is more comfortable and practical to use your own hair dryer. Although it might seem difficult to find space for your portable hair dryer in your luggage, it is actually easier than you think. Travel accessories are designed to fit even in the smallest bags. Portable hair dryers come with foldable handles, are usually small sized, compact and lightweight and comparing to older models, they incorporate all the useful technologies that larger products have. Tourmaline technology, adjustable settings and detachable diffusers are just three of the features that you can find in portable hair dryers. Another factor that might influence your decision when looking for a travel hair dryer is the fact that some products are really powerful. Giving the small size of portable hair dryers, you might imagine that they aren’t powerful enough and that they aren’t as adjustable as you might want. Some products might surprise you, as they are just as powerful as larger models that are designed for home use. If you are looking to buy the best travel hair dryer and you have trouble deciding, then the five reviews below might be of great help. We have selected five of the best-selling products on the market, based on their popularity and highlighted their pros and cons for your. If you are a frequent traveler or you simply don’t feel like you have enough space to store a large hair dryer, then you will love this product. Although it is small sized and compact, it is powerful, having 1000 Watts that help you dry your hair fast and efficiently, without damaging it. It incorporates Tourmaline Titanium technology, which most women simply love, as it helps protect the hair with the help of ions. After using this dryer, you will feel that your hair is light, shiny and full of volume. All of these qualities of the Babyliss Pro travel dryer are unexpectedly satisfactory, as they combine functionality, power and efficiency. This product has adjustable settings, yet you only have to choose from high and low functions. From a technical point of view, this is the perfect product to choose, especially if you are interested in buying a highly performant hair dryer. It is equipped with a strong motor, it has dual voltage, a smooth handle and a detachable handle. Also, it includes a concentrator nozzle, a comprehensible user guide and it is covered by a one-year warranty. Although this is an ideal choice for you if you travel a lot, it lacks a function that many women consider to be valuable and that is the cold shot button. 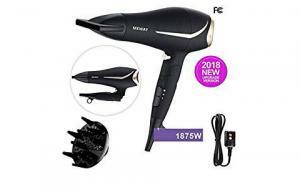 If you thought that the previous product was a good deal, combining the functionality and efficiency of a professional hair dryer, then you might find this one to be absolutely perfect. It comes at an even lower price, even though it is a newer model, it has a great design and many functions that will help you style your hair impeccably even when you aren’t in the comfort of your own home. This product was especially designed for travelers who need to save space and take advantage of advanced functions and a powerful motor. It has a 1875 wattage, a negative ionic function, adjustable speed and heating settings, a removable rear filter and it includes two concentrated nozzles, as well as a diffuser. There’s even more to it: it has a 1.8 meters cord that gives you full flexibility while drying your hair. This is the perfect travel hair dryer for a variety of reasons. It is incredibly comfortable to use, it is easy to clean and maintain, it has a design that allows you to maneuver it easily and it also has a cold shot button. By comparison to most similar products, it is highly adjustable. It has two speeds and high, medium and low heat. The negative ion technology helps you protect your hair while drying and styling it. It has a foldable handle that helps you save luggage space and allows you to organize your stuff with ease when traveling. If you want an ultra-powerful hair dryer that you can take with you anywhere, then this is a great choice. If the previous two products were medium-sized, yet foldable and easy to store, this one is probably the smallest portable hair dryer that you have ever seen. It comes with adjustable settings and a great price that probably makes it one of the best products on the market in terms of travel products. More importantly, it brings value for money. 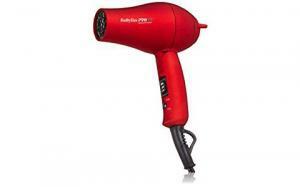 Are you looking for a small hair dryer that occupies almost no space in your luggage? Then this is exactly what you need. It comes with a foldable 7-inches handle, a hi-low switch for the heat and speed settings. It has dual voltage and a powerful motor that uses 1600 Watts, which is surprising for such a tiny model. This model is well known for its small size and its ability to dry the hair quickly and efficiently. In the case of the Conair Vagabond hair dryer, size really doesn’t matter. It can do the same job as a home dryer, but you can take it with you wherever you go, without having to worry about the space or weight of your travel bag. If you are thinking about taking a vacation and you are planning to have a perfect look every single day, you might want to consider this amazing product. Its cord isn’t very long, but that is the least important thing when you have a product that is this cheap and powerful. Hair care and maintenance is something that every woman has to invest in, as it is one of the great factors of influence when it comes to beauty. A hair that is hydrated, well-cared, perfectly styled and that has a healthy look is incredibly beautiful and draws the attention of everyone around you. In order to achieve this result and maintain a perfect look even when traveling, owning the ideal portable hair dryer isn’t enough. This is why we have included this adjustable bonnet hood in our list. This is a must-have if you have frizzy hair or if you are constantly traveling and you need to have an impeccable look. You don’t have to be a businesswoman to style your hair every day; if you like to see the best version of yourself in the mirror every morning, then this accessory will be of great help. This bonnet is easy to use, affordable and extremely practical. Basically, what it does is help you dry the hair by attaching to any standard hand help dryer. You simply have to place it on your head, covering the hair while drying. It includes 9-inches long rollers, a 40-inches long hose for better mobility and it has adjustable drawstring and chin strap. It is great for long and thick hair, natural hair or for drying your extensions or for deep conditioning sessions. It includes a travel bag, so it will be easy to store it in your luggage when traveling. Perfect hair styling is influenced by a variety of factors, from the shampoo and conditioning products to the hair dryer that you use. Using one of the best products on the market is extremely important when traveling. If everything happens fast and easily at home where you know exactly what to expect, everything changes when you are away from home. The climate, humidity and the fact that you are constantly on the go can make you feel that your hair is out of control. 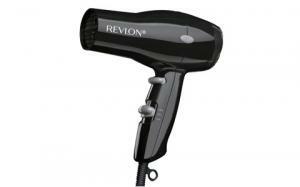 Having a portable hair dryer such as the Revlon Perfect Heat can totally save your day and make your experience more pleasant. This model is comfortable enough to be used both at home and while traveling, as it has a powerful motor and great technologies for hair styling and protection. This product is small-sized, compact and lightweight, which makes it easier to maneuver. From a technical point of view, it is a powerful tool, with 1875 Watts, two heat and speed settings, a cold shot button, a removable cap end and a hanging ring for easier storage. Also, it has anti-slip bumpers and a great grip. It weighs only 1.1 pounds and measures 3.4 x 9.4 x 7.2 inches, which is why it is the ideal option when traveling with a small bag. It is made of plastic, yet it is safe and comfortable to use. It doesn’t have ceramic coating, negative ionic technology or tourmaline technology, but even so, it is a product worth investing in. Is a travel hair dryer powerful enough? One of the most annoying things about traveling and staying in hotel rooms is that the hair dryer always has weak airflow. Freshening up your hair can be a pain, because weak hair dryers don’t give it enough volume and it takes forever to obtain a nice look. Owning your own travel dryer can save you a lot of time and effort. Also, it can eliminate the daily frustration that comes with spending so much time in the bathroom. Modern travel hair dryers are more powerful than ever. Being powerful doesn’t mean that it should be large, too. Manufacturers deliver gorgeous designs these days, making it possible to save a lot of space. Try comparing a few regular hair dryers with models that are designed especially for traveling and you will see that most models have powerful motors, yet work silently. 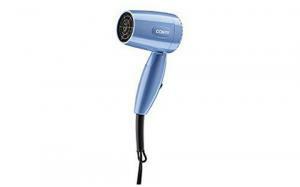 Some of the best models have around 1800 watts and produce enough airflow to dry your hair in a matter of minutes. Some are even more powerful, reaching 2300 Watts, while some are weaker, but your choice must depend on your type of hair and its needs. Some users don’t even need very strong dryers, as they aren’t suitable for thin hair. Modern technology allows manufacturers to add all kinds of great features to the smallest of the devices. For instance, ion flow and ceramic materials can be found in travel hair dryers. Why should you choose a travel dryer over a regular one? Believe it or not, travel hair dryers are so convenient that some people use them all the time. If a product is powerful enough, it can be used on a daily basis, not necessarily when traveling. Having all of the features that a regular dryer has, it can be used at home, too, as it offers impeccable results. The most important advantage that most users appreciate is the size of these products and the fact that they usually have foldable designs. They can be stored easily in any corner or your bathroom, in any bag or box. Another factor that you should be taking into consideration is the fact that it is more comfortable to dry your hair with the dryer you already own than with a new one every single time. Can a travel hair dryer be used internationally? This is an aspect that you should always check when buying a new travel hair dryer. Depending on where you are planning to travel, it is safe to have a product that comes with an international adapter. In case you find a model that you really love, but it doesn’t include an adapter, it is a good idea to buy one separately and keep it in your bag when going abroad. This way, you don’t have to check the type of outputs and plugs that a country or state uses all the time. Other than the voltage, you don’t need to check additional features, as this is the only thing that matters in terms of compatibility. Are you one of those travelers who like to take the comfort of their own home with them anywhere they go? Then it means that you have great experiences wherever you travel, as you eliminate the stress and discomfort that can be caused by the small details. Owning a high-quality travel hair dryer is probably one of the best things that you can invest in, especially if you are planning to travel a lot in the next period of time. Being used to a specific dryer model helps you style your hair easier and more beautifully, even when on the go. On the contrary, having to style it using standard hotel room dryers can be a challenge. Analyze the pros and cons of the products in our list and see which one meets all your requirements. Once you have decided, you will be able to enjoy the benefits of a compact, powerful hair dryer at home or in a hotel room, without having to compromise.